Building a strong presence on Google+ naturally affects your presence on Google as a whole; the essence of Google+ is Google itself. The improvement is two-way: Improve your presence on Google, and you improve your Google+ experience. Just posting to the Public: Google indexes any text, link, image, or video you post to the public. For other Google+ users, these posts appear in their normal search results through Google Search Plus Your World. The more people sign up for Google+ — and the more people you connect with on Google+ — the more likely they are to find your posts through simple Google.com search. Sharing a link to the Public: Google thrives on links; they are what holds the web together. In Google Search Plus Your World, Google+ users see ranked search results that appear based on the number of shares, +1s, and comments that those URLs have. 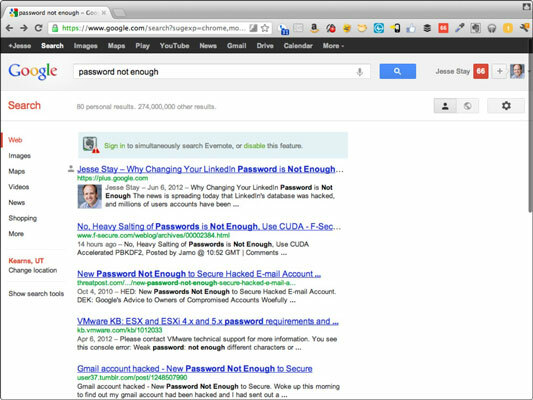 You can even share and +1 the links right from Google search results. Therefore, whenever you share a link to the public on Google+, you add to that URL’s authority on Google among your friends who use Google+. Who knows — someday this effect may apply to all Google search results. +1’ing someone’s share or post: Similar to shares, +1s can also affect the ranking of a link in your Google search results. The more +1s, the better it will rank, because that shows some level of popularity in comparison to other links that match the keywords you’re searching for. Seek +1s for your posts. The URLs for those posts get better traction. Commenting on someone’s post: The number of comments on a post can also affect how a post ranks in Google.com search results. Naming your Google+ Page appropriately: Since the title of any website has a big impact on how that website ranks for certain keywords, the title of a Google+ Page can also affect how that page ranks in Google.com search results. Google+ Pages are public — they get indexed too. As Google+ Pages are integrated into Google Search Plus Your World, you can circle and +1 those pages right from Google.com search results. Those results become more prominent on Google.com; you can use feature to ensure that your brand is front and center in search results. Adding a good tagline for your personal or page’s profile: A tagline strongly affects not only your ranking in Google+ search, but also how Google.com ranks your profile or page in a traditional Google.com search. A good tagline can mean that your page appears ahead of similar pages with the same name as yours but no focus in the tagline. Installing a Google+ Badge on your website: It’s pretty clear from tests that the more you can link your website with a Google+ profile, the higher it ranks in traditional Google.com search results. This is especially the case as you’re competing for valuable real estate against similarly ranked websites that aren’t on Google+ or haven’t linked properly. Installing a Google+ Badge will ensure visitors to your website know that Google+ Page is yours, but at the same time it also tells Google that it’s yours, which gives your website a level of authenticity that other websites don’t have. Adding your website to your Google+ personal or page profile: Just as you need to have a Google+ Page Badge linked from your website that tells Google where your Google+ Page is, having a link from your Google+ Page will tell Google where your website is. If the two point to each other, that gives a level of authenticity to not just Google, but your users and customers as well — ensuring that everyone knows this website is yours and that the Google+ Page is linked to it. This, in turn, improves your ranking and experience on Google.com itself. For every article on a blog, the search result on Google.com stands out a little more than the others because it has a picture and a name next to it. Google automatically reads this connection and adds your picture from Google+ as the author. Google appears to rank articles that have actual, verified authors a little higher than articles that don’t. This means your articles will also rank higher as a result of this link. 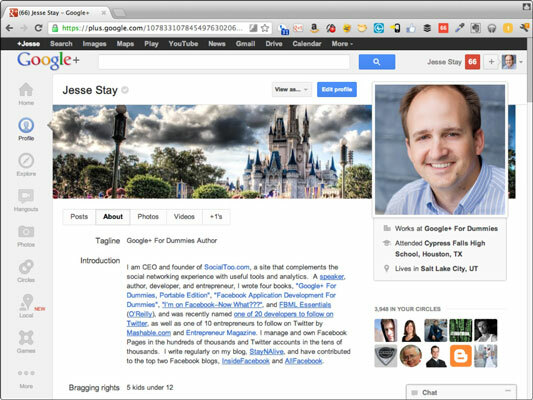 You actually don’t have to link directly to your Google+ profile. There is a certain format you can add to profile pages you’ve built on your website that will tell Google where the profile image is, what the name is, and more so Google can properly parse the content into the Google.com search results. However, if you don’t in some way link that profile on your website to a Google+ profile, it’s a lot harder for Google to identify you as a real person writing those articles. Your content should still rank higher if you can find some way to link articles on your blog to an actual Google+ profile. Play around with that; see how it affects your ranking.